Okay, you may be asking yourself, yet again, why on earth would I make my own flour tortillas when I can buy them for about $2.00 a package?! Because I can make them myself!! Haven’t you ever planned on having burritos or soft tacos for dinner only to find you forgot to buy the tortilla shells?! I have, lots of times. And what did I do? I scratched that menu and scrambled to think of something else to make with the thawed hamburger that would go with chips and salsa for dinner. Well no more!!! Come on you guys!! You can do this and it only takes a few ingredients that you already have on hand. Just read on and see if you’re not convinced. I betcha you’ll be making these in no time. DISCLAIMER: I will say this; it would be faster if you had a tortilla press (and more fun!! Everybody in the family’ll want to help!! You may even have to keep it a secret that you’re making them!). I don’t have one, but, as of this writing, my wonderful hubby is in the process of designing one to build for me. 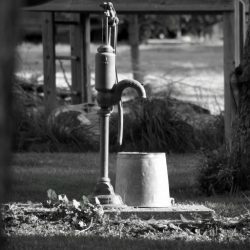 I know what you’re thinking already – don’t you people ever buy anything ready-made? Yes – cars and Q-tips. Anyway, reading the reviews of the aluminum, and even cast iron, tortilla presses, the handle breaks off within the first 60 days!!!! And the handles seem to be a pretty key component!! Why would I put myself through that?!! So, until I can show you my super fantastic press, this is how I make them – for now. Note: The onions behind the shortening are not part of this recipe. They’re just hangin out. I need to say something about measuring your flour. 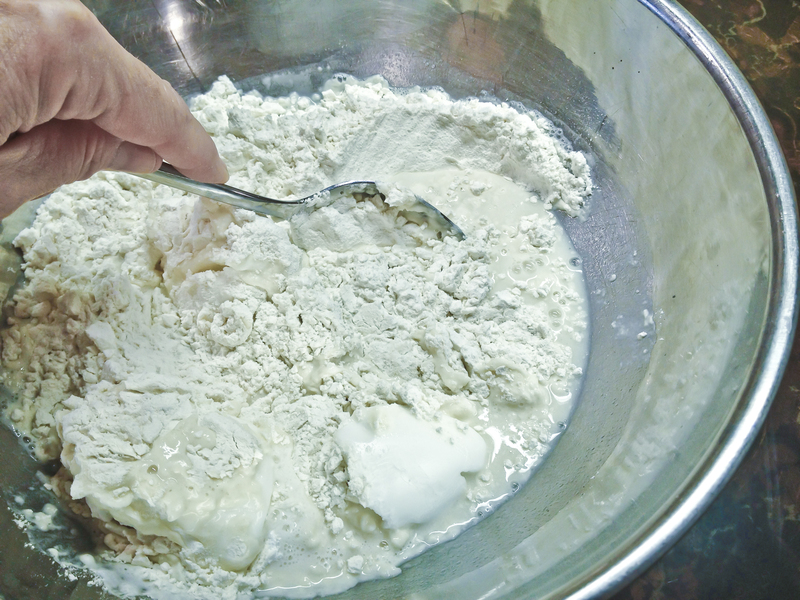 Before you start to measure, use a large spoon and stir the flour in the canister a few times. This will aerate the flour to help you get a more accurate measurement. 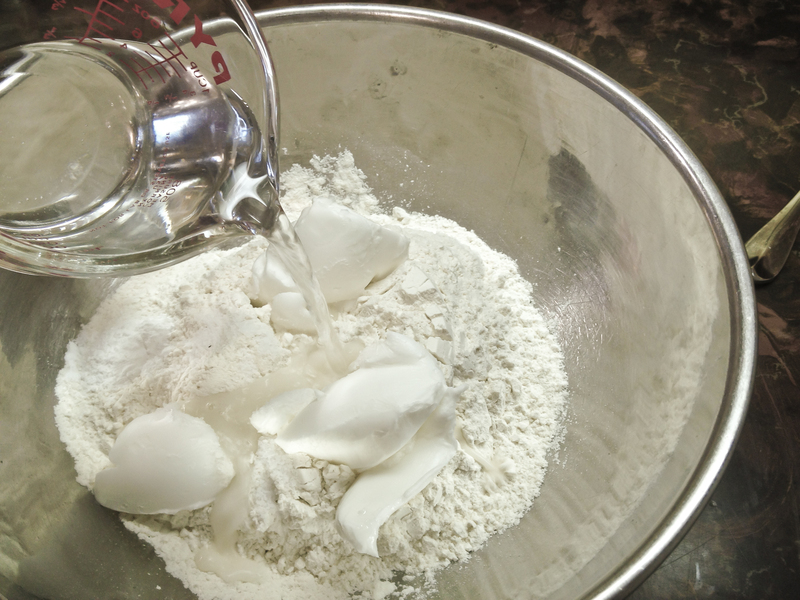 Flour “settles” over time and it will pack more in the measuring cup. That’s not for just this recipe, it’s for all recipes. Don’t roll those eyes at me; it’s an important fact. This has been a Public Service Announcement. 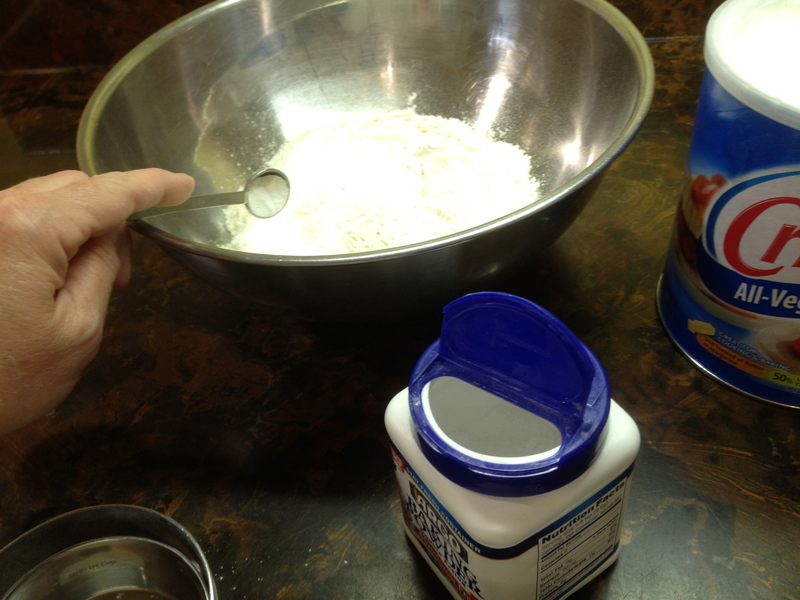 Now, after the flour has been carefully measured, add the salt and baking powder. Use a whisk to get everything combined well. Now, one more thing; listen to your prairie godmother. I’m just sayin, I think it’s TERRIBLY important for EVERY home cook to have measuring scales in his/her kitchen. Did I say TERRIBLY important, I meant REALLY TERRIBLY IMPORTANT. The reason for this is, there are times like this, when the volume (measuring cup) of something is a little weird. Like a hair more or less than the measuring cup holds. The accurate measurement for the shortening in this recipe is actually 3.5 ounces. This, in measuring-cup-world, is a tiny dollop more than 1/2 cup. Now, is that tiny dollop more going to make or break this recipe, will your kids be stunted from exposure to a mis-measuring of this magnitude?!! Hey, it could happen, but not this time. I’m just sayin that scales should be included in your kitchen equipment inventory. And on that note, I’m not talking about the little $10 scales that measure in whole ounces only. I’m talking about perhaps a scale made by Salter (great RELIABLE brand. There was no compensation to the owner of this website for the promotion of this product – much to my dismay). 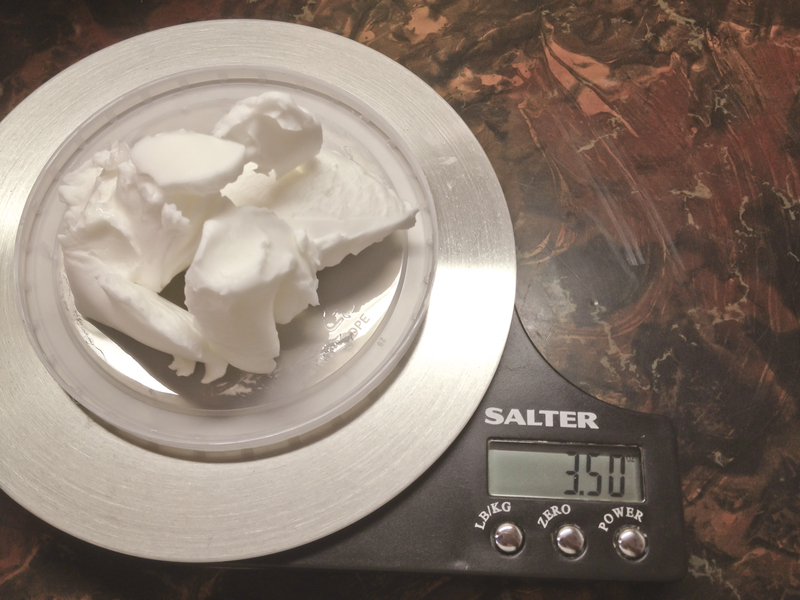 You want a scale that measures in pounds/ounces, ounces and grams. Ask for it for Christmas!! Put a real gilt trip on your kids and ask for it for Mother’s Day/Father’s Day, for ALL you do for your kids, and have everybody pitch in!!! You can thank me later. Once the shortening is measured just add it to the dry ingredients. Next, add the hot water. This should NOT be boiling by any means, just hot from the tap. Just pour it right in there. Now stir it all together with a wooden spoon (or you can dive right in with your hands now) until you need to start using your hands anyway (and pardon my “man hands” in this picture). Mix it really well. The dough comes together very nicely and really doesn’t stick to your hands much at all. 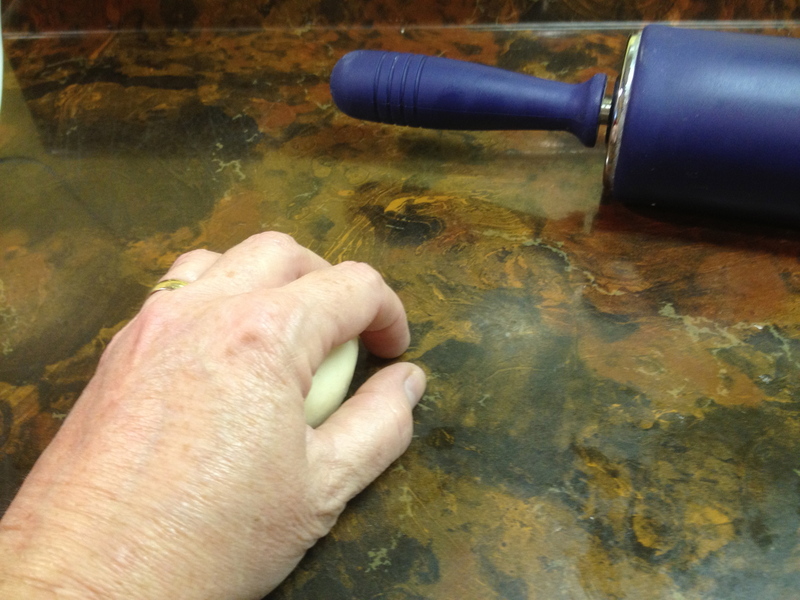 Turn it out onto a countertop or table. Use ONLY the slightest amount of extra flour should it start sticking to the counter. What’s on the counter here is PLENTY! Now we knead! We won’t knead this as vigorously as we would bread dough. Just kinda gently, even with one hand, knead it around for 3 minutes so set your timer. T-h-e wheels on the bus go ’round and ’round, ’round and ’round, ’round and ’round . . . second stanza – girls only this time! ……….early in the morning! There! Our three minutes are up and look at the dough, it’s nice and smooth and very supple!! Nicely done! Now we let it rest. Roll it into a ball and put it back into the same mixing bowl, cover it with a towel and let it rest for 15 minutes. DO NOT CHEAT by rushing this step. This resting time is really gonna make the rolling out nice and easy (or the pressing if you have a press that still has the handle on it.). After the 15 minute rest, it’s time to divide the dough into individual portions. 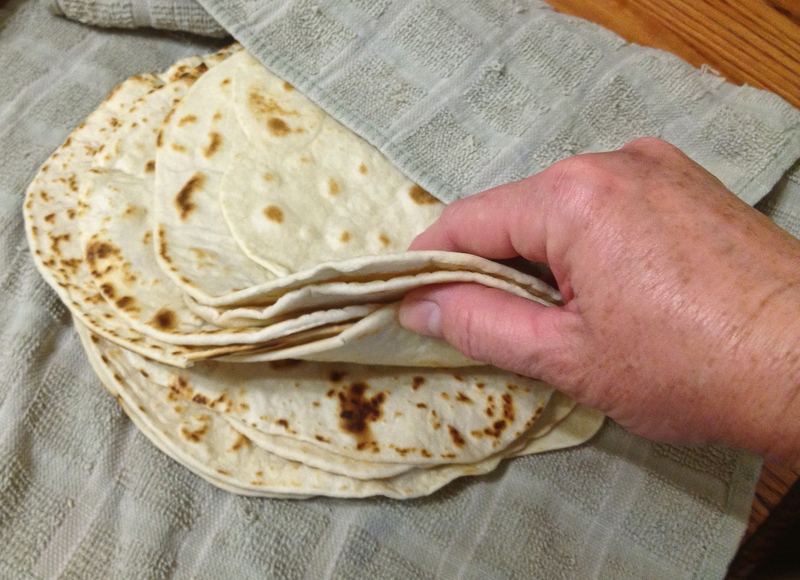 Using your scale (I know you went out and bought one since we last talked about this), if you’re making the 6″ tortilla wrappers (what anybody can do with just a little ol’ 6″ wrapper is beyond me!!! 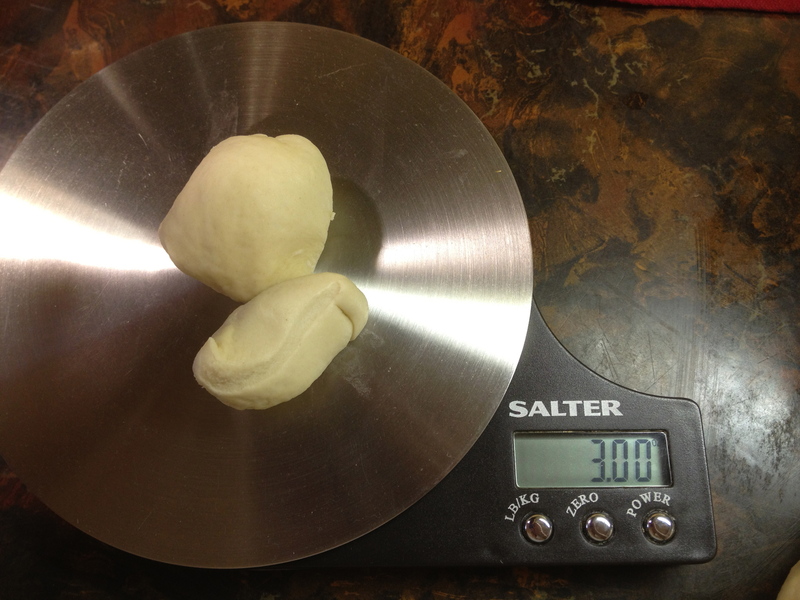 ), you’ll need a portion of dough that weighs 1.5 ounces (or a dough ball about the size of a walnut). 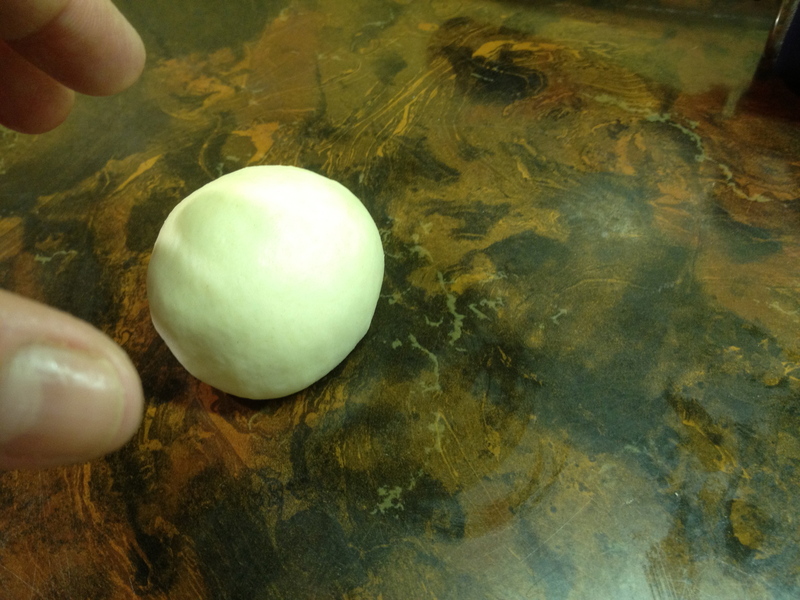 I made the large tortillas, between 9″ and 9 1/2″, which started out as 3 ounce dough balls (this size is bigger than a ping pong ball but a little smaller than a billiard ball. It’s been a while since I’ve played either but I think that’s pretty close.). Here’s the 3 ounce size for a better idea. Again the “man hands” show up! As you weigh them, put them back into the original bowl and keep them covered or they’ll dry out – that’s a bad thing. Make the ball as round as possible before you start to roll them out or press them. Put the dough on the counter (make sure there’s no flour on the counter) and cup your fingers around it, not too tightly but touching all around at the bottom. Move your hand in a tight circle making sure the ball doesn’t so much roll around but is kinda pulled tightly as it moves in the circle, making itself round and smooth. This takes a little practice but you’ll get the hang of it. I have no idea where my wrist went – must be break time. And . . . ta da!!! Oh man, that’s just beautiful!! As you become more and more comfortable making these, you’ll get the rhythm of rolling out (or pressing) and cooking. An electric griddle is really the best tool to use, but ours is a pain to reach in the back of the corner cabinet so I use a stove top griddle, which works well. A nonstick skillet also works well. For the electric griddle I would suggest a target temp of about 325 to 350 degrees. Experiment with it but stay close. For the stove top griddle and the skillet, medium to medium high is a good place to start but again, stay close! Remember to lift an edge often to check for browning. Before you start rolling out or pressing, get your griddle or skillet ready as well as either a tortilla warmer or a couple of kitchen towels to cover and keep them warm as they come off the heat. For those of us who don’t yet have our press, flatten the dough ball slightly so it’s more of an oval. I know, after all that to get it so perfect and to just flatten it. Those of you who do have a press, celebrate that you get to keep your perfect sphere just a little bit longer – until you close the lid. Back to the manual labor of the rolling pin; apply gentle pressure and roll over the oval 4 or 5 strokes until it becomes an elongated oval. Try not to roll completely off the ends of the dough as you’re rolling – you don’t want the edges to be smashed to “see-through”. Turn the dough a quarter turn and roll across it 4 or 5 more times. It’ll be a weird shape at this point but as you continue to rotate the dough a quarter turn, it will eventually become a circle. You may have to exert a little more pressure because they should be getting bigger and thinner. 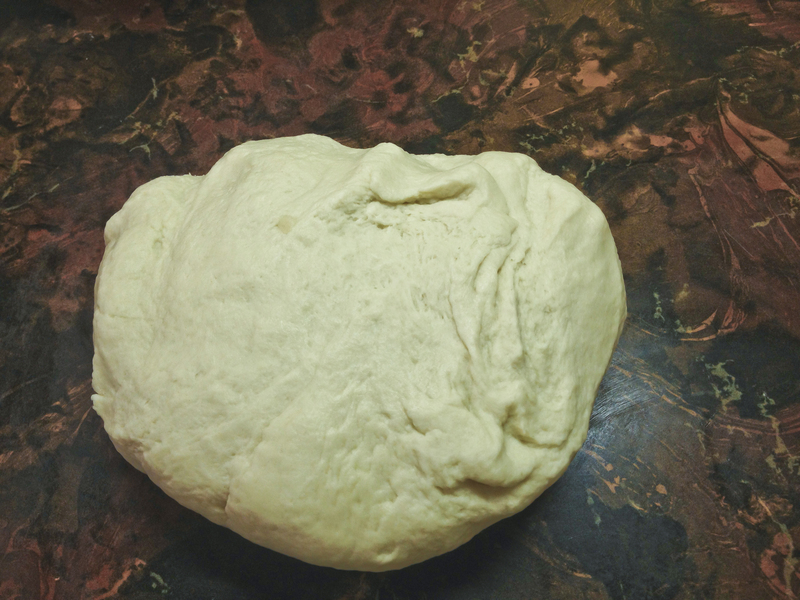 Rotate the dough a quarter turn, 2 or 3 more times and repeat rolling 4 or 5 times with each turn until you have a thin, flat circle measuring either 6″ to 6 1/2″ or 9″ to 9 1/2″, depending on the size of the original dough ball. These should be a little thinner than the finished product of the store bought tortilla wrappers. The circles will shrink a bit when cooked and they will become about the thickness as the store bought when done. Don’t worry about how thin the dough is; it’s really resilient to tears and won’t stick like glue to the counter – maybe like Velcro, but just be kinda gentle and it’ll come right up. And remember, these are homemade which translates into they’re not all gonna to be perfect circles. If it makes you feel better, call them “rustic”. Rustic describes anything that didn’t turn out too purdy. For you tortilla press people, you may now gloat over your perfect flat circles. Move the tortilla over to the griddle. Do not add any oil to the griddle!! These are cooked on a dry griddle (or skillet). As they cook, you’ll see bubbles (some will get pretty big) as the steam builds up and the tortilla separates inside. Don’t worry, they won’t split in two. Use your spatula to gently and slowly flatten them. Be careful getting too caught up in flattening them because they may burn on the bottom. Just take my word for it. Keep lifting the edge and checking frequently so they don’t get overly browned. You can flatten the bubbles from the other side as well. The lighter colored areas in the picture below are where the bubbles are starting to form. When the bottom side is nicely browned, flip it to brown the other side. Ahhh. Nicely browned! Voila!! Now look at those!!! Any burrito, taco or fajita meat would be proud to be wrapped up in something that looked like those!! And you made them!!! YOU made them!!!! Your family and friends will marvel over your culinary expertise!! So say good-bye to missing out on burrito or taco night just because you forgot to buy wrappers!! Don’t even put them on your grocery list any more! Walk with your head held high next time you walk down that tortilla aisle (well, unless you need the hard shells, or taco sauce, or a seasoning packet). But anyway, you can walk past the flour tortillas and say, “Oh, I’ll just make my own”. Oh, heads will turn!!! Here’s the whole recipe in quickie form. I hope you’ll give these a try!! 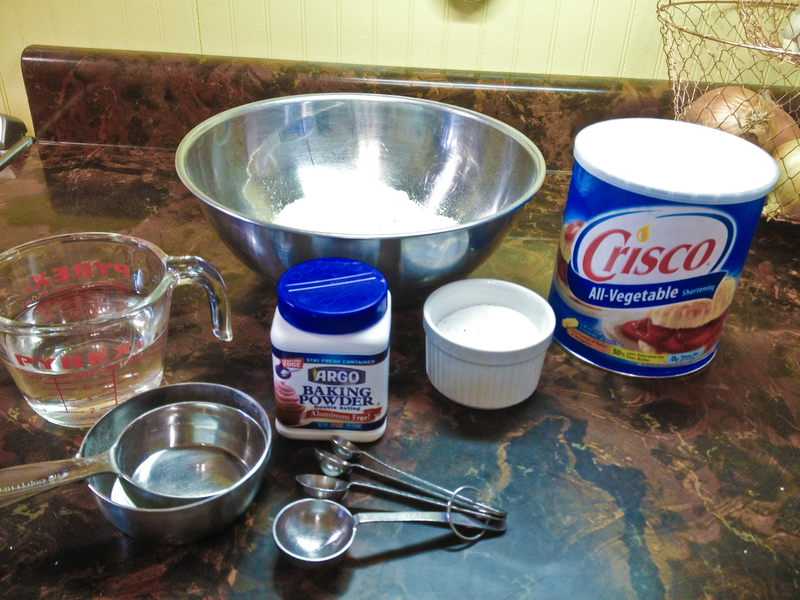 In a medium size mixing bowl, combine the flour, salt and baking powder with a whisk. Add the shortening and hot water. With a wooden spoon, combine the ingredients until it becomes too difficult, then use your hands. When fully combined, drop the dough onto a clean dry countertop or table. Knead the dough (no need to be as vigorous as for bread dough) for 3 minutes. Add as little flour as you absolutely need to keep it from sticking to your fingers and the work surface. At the end of the 3 minutes, return the dough to the original bowl, cover with a damp dishtowel and let rest for 15 minutes. DO NOT SKIP OR RUSH THIS STEP. Divide the dough into 1.5 ounce balls for small tortilla wrappers (6” to 6 ½”), or 3 ounce balls for large wrappers (9” to 10”). 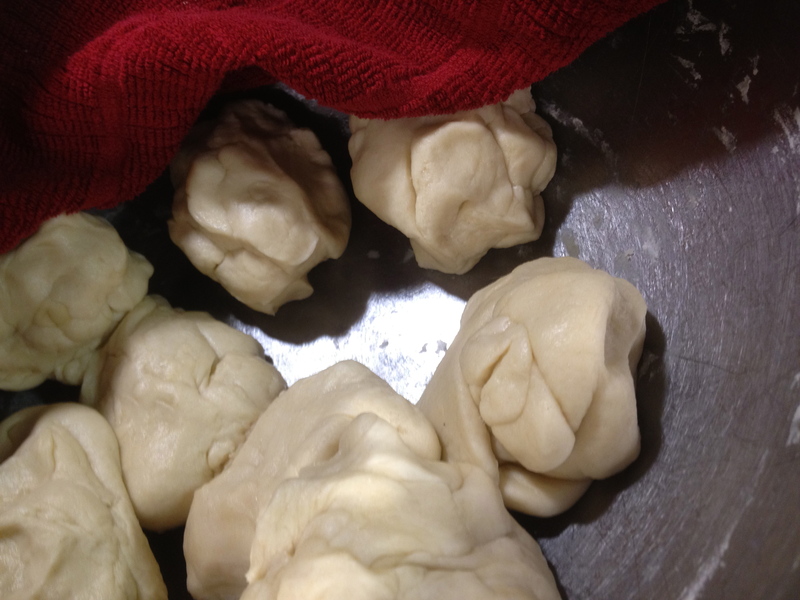 As the dough is weighed, return them to the bowl and keep covered with the towel. 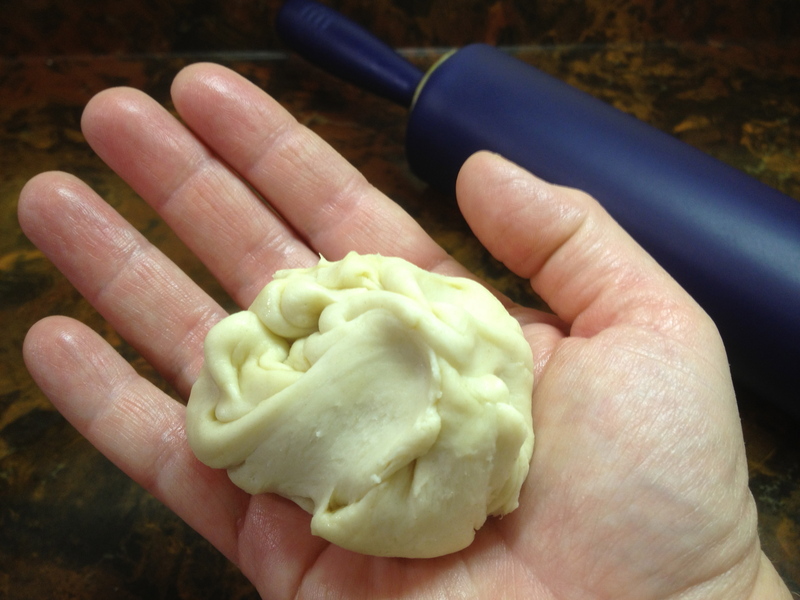 Roll one portion of dough into a ball, then flatten it with your hand into an oval. 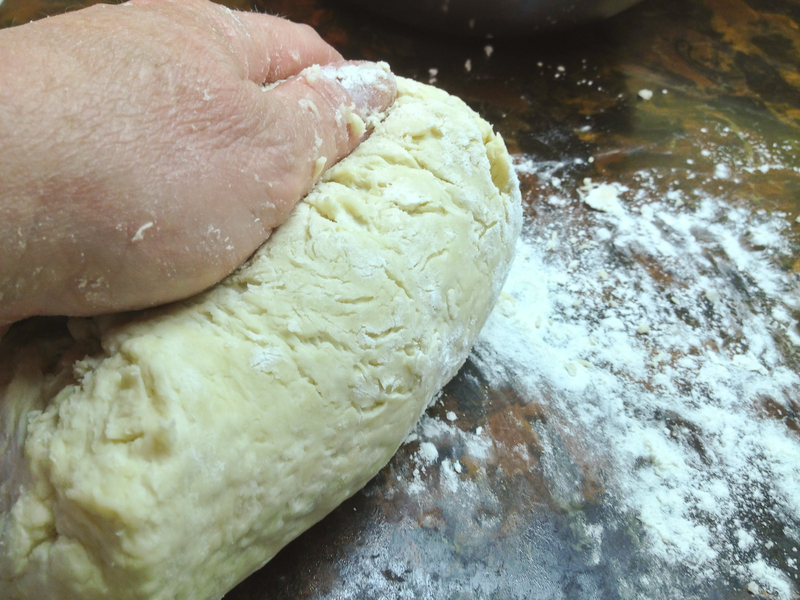 With a rolling pin, roll it into an elongated oval, then turn the dough 1/4 turn. 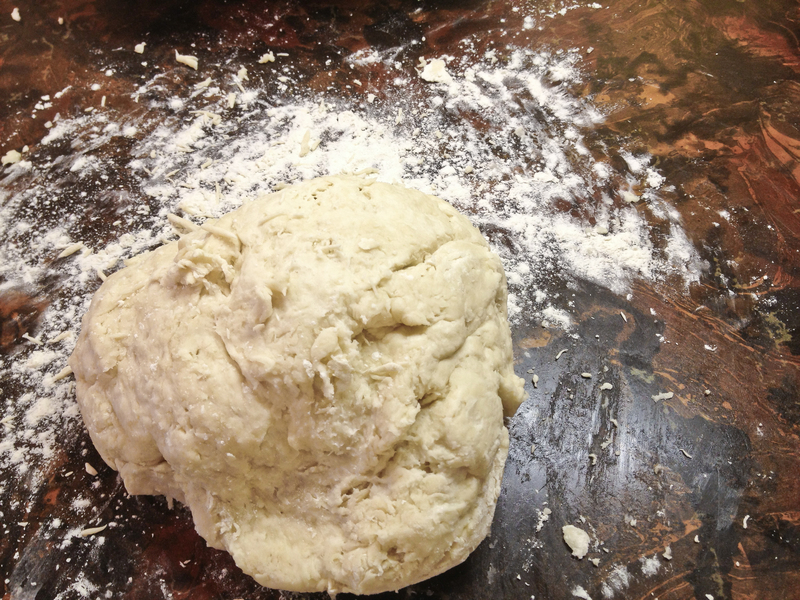 Continue rolling and turning the dough until you have a thin circle. The dough should be rolled just a little thinner than the store bought wrappers. Carefully lift the dough from the work surface (no need for extra flour – the rolled dough will release easily – just be gentle) and place onto an ungreased hot griddle or nonstick skillet. Stay close, it won’t take long. You will see bubbles start to form. 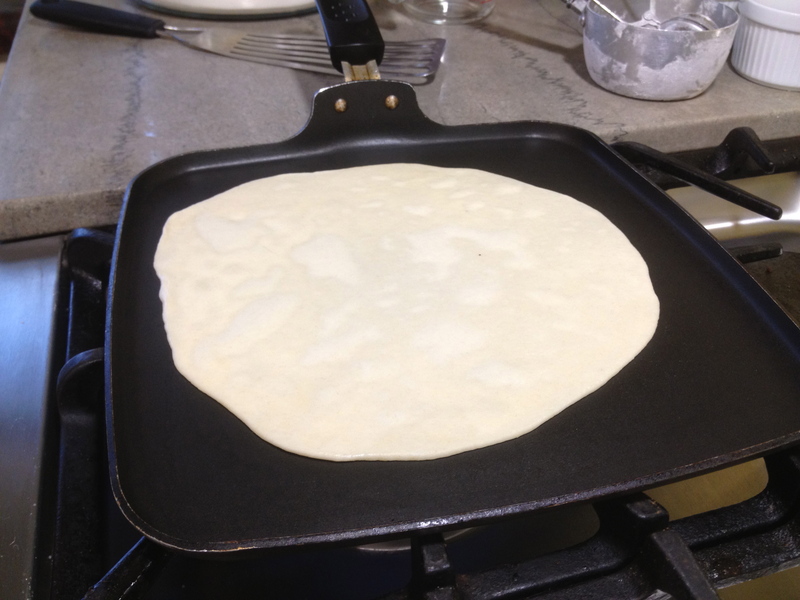 If a very large bubble forms, gently press it down but keep an eye on the bottom side so the tortilla won’t burn. 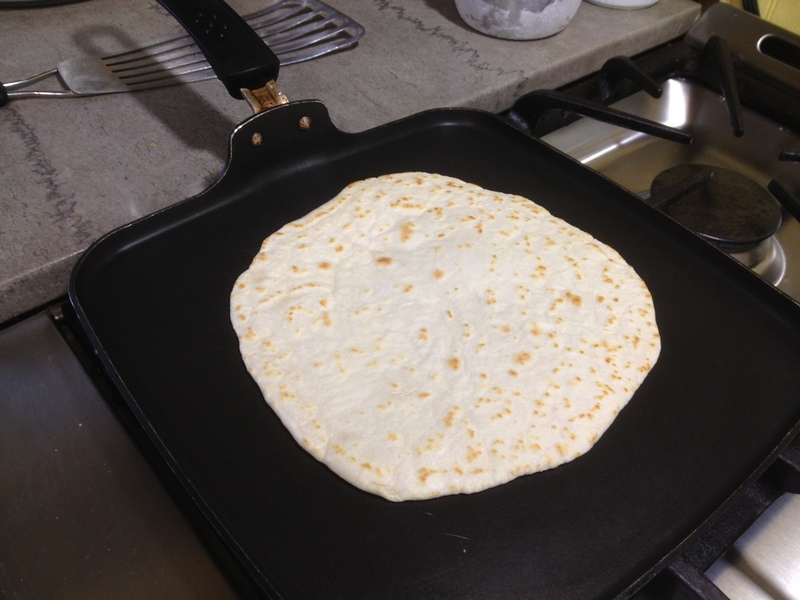 Flip the tortilla when it has golden brown “spots”. The entire surface will not brown. Check the bottom side frequently. You’ll notice that only the raised areas are getting brown – that’s good. Flip one more time to the first side only for a few seconds. 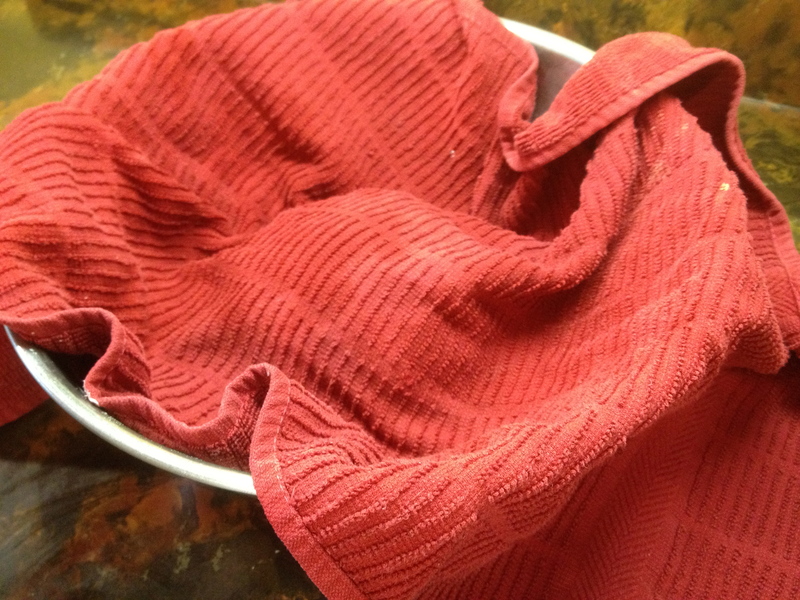 Remove from the heat and place in either a tortilla warmer or wrap them in a couple of slightly dampened warm towels. Yields approximately 18-20 small or 8-10 large tortilla wrappers.